Location: Situated in centre of Bethesda, fronting onto the gardens behind the War Memorial. 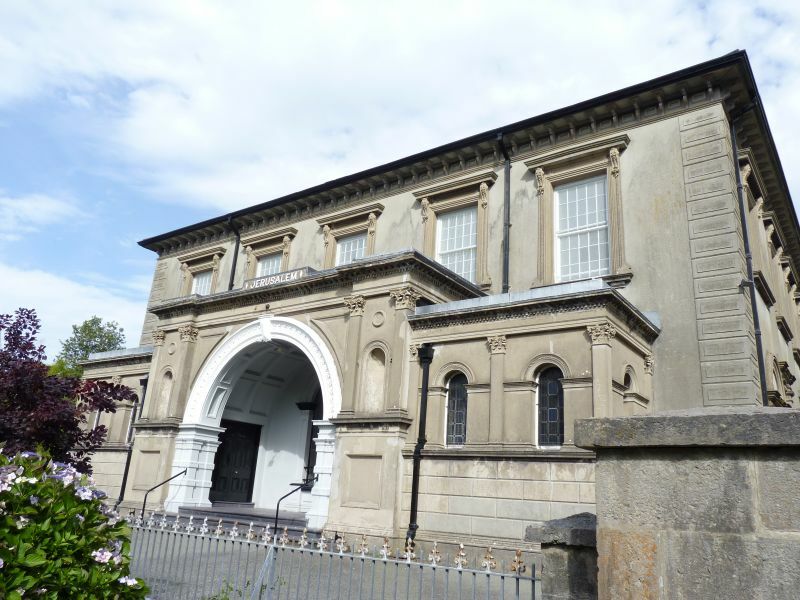 Calvinistic Methodist chapel built 1842-3 for £3,400, and remodelled 1872-5 for £1,778 by Richard Davies of Caernarfon. A large organ was bought from Huddersfield Town Hall in 1903, and presumably the organ loft dates from 1903-5. The very large schoolrooms and vestries behind, are probably part of works costing £3,000 in l900, though a parlour, school and lecture room are mentioned in the 1872-5 works. The chapel seats 980. Large scale near-square plan chapel basically of 1842 but the stucco detail and large porch added 1872-5. Unpainted stucco with hipped slate roof, Italianate palazzo style. 2-storey, 5-window front and 4-window sides. Quoin pilasters with facetted rustication, deep eaves on brackets with square panels between. Windows are very large small-paned sashes in moulded architraves with rope-mould detail and console brackets to flat cornices. Five 30-pane sashes to first floor front. Ground floor altered by addition of projecting three-bay porch addition with flat roofs. Centre is a monumental round arch between pilastered outer bays, the whole under a full entablature with modillion cornice, broken forward over outer bays. Arch has keystone, acanthus detail to mouldings, and big moulded imposts. Imposts are above squat banded piers detailed with angle pilasters, caps and incised florets to bands. Outer bays have panelled square bases to impost level, angle Corinthian pilasters above framing a niche (with rope-mould detail) and small roundel. Lower wings are two bay with blank channelled lower part, moulded sill-course, two small arched lights with moulded arch and impost bands, between 3 Corinthian pilasters carrying entablature and cornice. One-window similar end walls. Porch interior has panelled broad arched roof, panelled doors each side and a very large pilastered arched aedicule to centre with stained glass window, originally possibly a door. Slate floor and three broad front steps. Sides are 4-window, 2-storey, to similar detail, 24-pane sashes and ground floor door in bay nearest front wall with pilasters and blank arch. Behind is very large hipped-roofed two-storey schoolroom and vestry block, with rear 6-window range of 32-pane sashes above, 24-pane below. Outside steps at W end to pilastered arched doorway between 2 sashes in similar surrounds. 1872-5 remodelling was planned to resemble an amphitheatre, and the original square is disguised totally by a curved wall with nine 30-pane sash windows in the gallery, some taking borrowed light. Pulpit wall has been altered presumably in 1903-5 for the organ loft. Gallery is U-plan on 11 plain iron columns, the front of long grained panels under continuous narrow band of pierced cast-iron. Amphitheatre plan means that both the ground floor seats under the gallery and those in the gallery are steeply raked. Within the open centre are curving pews, a half-round orchestra seat, backing onto a deacons' seat enclosure of rebated rectangular plan, i.e. with seats facing and side-on to pulpit. Pierced wood panels in narrow bands. Pulpit is a monumental design in polished mahogany, freestanding and curvaceous with polished brass rails to steps each side. Triple-curve front projecting over curved base, the main half-oval front with lavishly carved classical panel. Within a long upholstered curved ended seat. Organ loft behind, raised to gallery level, is a very fine Renaissance-style triple-arch composition. Centre monumental pilastered and corniced frame to an arched recess, with lavish decoration to cornice, frieze, spandrels and capitals. The smaller pilasters that carry the main arch are echoed in the two narrow flanking arches which are not in corniced frames. Balustrades to flanking arches and handsome timber projecting loft to centre with 5 carved panels, each with main shell motif. The organ itself has painted pipes and classical detail to case. Main organ has two curved pipe-clusters, those to the sides have one, but pipework in left arch is dummy, screening access to loft. Ceiling expresses the circular concept of the design and is one of the finest features of the interior. Essentially a very large saucer-domed main circle, with broad moulded surround and moulded ring to centre rose, is flanked by radiating panels with similar moulded ribs and small roses, the panels following the U-plan of the interior, leaving two spandrel panels to frame the rest of the circle. The ribs and mouldings have ornate floral undercut detail. In the centre is a gilded vase-shaped pendant with open funnel and exterior acanthus leaf decoration. Funnel is lined with mirror-glass. This may be the 'gas sunlight' by Stroude & Co of London described in the 1882 history. The pendant metal chandelier is later. Schoolroom and vestry building has one very large room above with hipped boarded ceiling. Ground floor divided by pine partitions into one room across N end and then 6 to S, 3 each side of a spine corridor, with corner fireplaces, but capable of being combined into one by sliding partitions. A chapel of remarkable scale and dignity unusual for the 1840s, with a richly detailed interior of the 1870s to a semi-circular plan of exceptional interest.